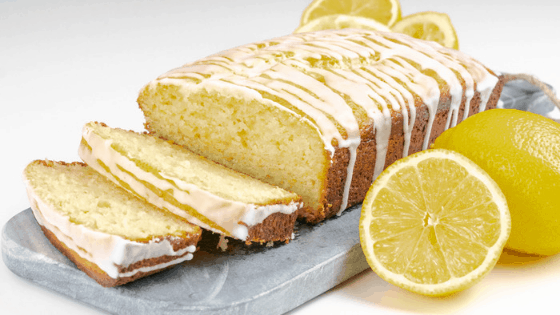 This lemon loaf made with freshly squeezed lemons and drizzled with a delicious and sweet lemon glaze is perfect for either breakfast or dessert! For this recipe, you will need a 9×5 loaf pan. It’s important to grease the bottom and the sides of the inside of the loaf pan. It will save frustration and time when it’s ready to be moved to a wired rack! It only needs a light coating, and once you’re ready to flip the pan over to remove the loaf, it’ll slide right out! You could also use parchment paper, it will work just as well! In this recipe, only freshly used lemons are used. You can use bottled lemon juice if you would like to, but I’ve never made it that way so I can’t vouch for the flavor that the loaf will produce once baked. It’s really easy to use fresh lemons for this recipe because you’ll be using lemon zest as an ingredient for the batter. It’s easy to zest a lemon by using a lemon grater, and it’s simple and pretty quick! I then slice open the lemon and squeeze out the juice into a small bowl and then dip a measuring spoon to pull out what I need for the recipe. It’s super simple! With Spring and Summer comes cookouts, family dinners, and potlucks. This lemon loaf is so easy to whip up and it’s simple to even double the recipe! You can easily get 12 nicely sized slices out of one lemon loaf so it can feed a small gathering easily! A moist and fluffy glazed lemon loaf made with lemon zest and freshly squeezed lemons. Grease a 9x5 loaf pan with cooking spray. Make sure to get bottom and sides. In a medium bowl, beat the eggs and sugar together. Add in the vanilla extract, zest, lemon juice, salt, and oil. Add in the baking powder, and sour cream. Slowly add in the flour, beating until well blended. Pour into greased loaf pan and bake for about 45 minutes. Check the center of the loaf with a toothpick. The toothpick will come out clean when done. Remove from oven and let cool for 10 minutes before transferring the loaf to cool completely on a wired rack. Make sure the loaf is completely cool before adding the lemon glaze to the loaf. This will prevent the glaze from melting into the loaf. Prepare the lemon glaze by mixing together the confectioner's sugar and the 3 tbsp of lemon juice in a bowl. If it needs to be thinner, add a tbsp of lemon juice at a time until you have reached your desired consistency. Drizzle on top of the completely cool lemon loaf and serve.